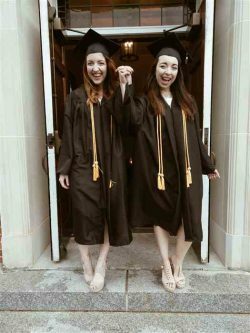 Photo by Brandon Paykamian/Johnson City Press: Sisters Amanda and Tiffany Florian are shown after they both graduated from Milligan College on Saturday, two of three sisters to graduate from the college. Read the original here in the Johnson City Press. That’s what Amanda Florian had to say about finally graduating from Milligan with a degree in communications and a double concentration in journalism and film. Interestingly enough, she and her two sisters are triplets who graduated from Milligan in similar media fields. Both Amanda Florian and her sister, Tiffany, graduated together Saturday morning in Seeger Chapel. They both worked as writers and editors at Milligan’s student publication, The Stampede. They both worked for a while as interns at WJHL-TV, and Amanda also briefly worked as a collegiate correspondent for USA Today. Tiffany, who majored in communications and minored in multimedia journalism, actually had an internship at the Johnson City Press when she was still a student, and their sister, Brianna, currently works as an entertainment host for a cruise line in Australia. With all of this in mind, it may be safe to say the Florian sisters are very similar in more ways than one. Though Brianna wasn’t at Seeger Chapel on Saturday morning, she was with her sisters in spirit. Both Amanda and Tiffany made a point to emphasize how the three sisters have always stood by each other and spent time doing everything together, including much of their academic endeavors. The sisters, who are also classically trained musicians, even performed on NBC once. The Florians both emphasized that their experience studying at Milligan College has been a great one in which they’ve all grown as people and gained valuable knowledge in their fields. For many, college is a time for self-exploration and learning what suits them. For the Florians, college was a time for them to find their passion for media. Before the Florian sisters moved from Charlotte, N.C., to start school at Milligan, they were still trying to figure out what they wanted to study. Amanda mentioned that she found her love for journalism while she was a student at Milligan. From there, her career got an early start. As the sisters went into Seeger Chapel to meet with other fellow graduates, the room was filled with excitement and anticipation for the future. Though many of the graduates were nervous about what the future will hold, the Florian sisters said they feel positive and optimistic about what tomorrow will bring for them. Other than the Florian sisters, over 200 other students graduated from Milligan on Saturday, many coming from different parts of the country. At a 10 a.m. ceremony, 113 students received their degrees, and another 111 received their degrees at a 2 p.m. ceremony.